" ... brilliant songwriting ... great, thoughtful lyrics and very convincing melodies. It is really great to hear an album where the songs, the performance, the overall feeling, really creates "a picture" for the listener. This album really feels like an "album" in the truest sense of the word!" "What a voice! 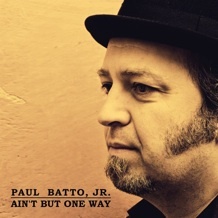 ... with distinctive, rather dark timbre ... Paul Batto, Jr. sings ten of his originals of exceptional quality. "Whatcha gonna do" and "Smilin' " bring the delta to the urban blues club, and then there are exquisite ballads like "Put Your Load down" and "Down On Memory Lane" ... between the twelve-bars and the more lyrical moments he creates a highly unique mood. Great record!"